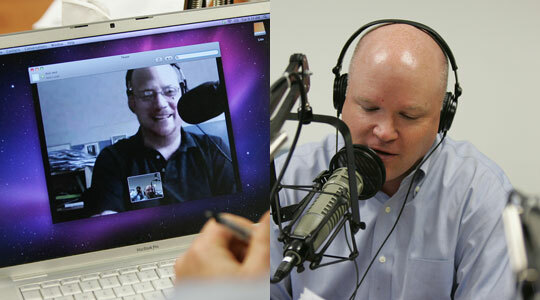 Summary of today’s show: Greg Willits, a pioneer in Catholic new media, talks with Scot about hosting a nationally broadcast Catholic radio show, The Catholics Next Door, with his wife, Jennifer, revealing the real life of a normal Catholic family each day on the air; the gathering of Catholic new media fans and professionals alike in Kansas City this weekend for the Catholic New Media Conference; how the Church, in its lay and ordained members, need to be patrons of the new media, supporting this work of evangelization that is vital to our future; and the new Catholic sitcom Greg and Jennifer filmed in their home for CatholicTV. 1st segment: Scot welcomed Greg Willits. Scot said Greg was one of the founders of the Star Quest Production Network and three years ago they started the Catholic New Media Celebration. Last year, the CNMC was in Boston and this weekend it’s in Kansas City. Greg said the Holy Spirit has been leading many people from around the world into Catholic new media. It’s been appropriate to gather people in all aspects of new media: blogging, podcasting, social networking. People are so spread out, and when they bring everyone together there is a synergy and excitement and inspiration to see first hand the clarion call to go out and evangelize the world, using whatever technology have. Greg and Jennifer used to podcast from a studio they built in their closet. Fr. Roderick Vonhogen was podcasting from his rectory in the Netherlands, but they were working in isolation. SQPN and the CNMC bring people together to check in and support each other and help one another. Every year, they see it become more professional, while there also remains room for those who just want to get started. Scot said he experienced hope during last year’s CNMC, meeting the pioneers in Catholic new medias and seeing how it’s all working. Scot asked Greg where he thinks we’re at by the Church. Greg said there’s been a study that shows a low percentage of Catholics consuming new media, but Greg thinks they may have looked at the wrong study group. Greg said we have a long way to go anyway compared to the other Protestant churches and the Mormons and their online presence. Greg said the big sore spot is where the money to do this is coming from. The talent is there and the desire is there, as evidenced by the people coming from all over for the CNMC. People are very interested, but there’s no funding to help people to continue to do this and the funding is going to the people who have the right connections. Greg said he and his wife Jennifer were working full-time on SQPN, but there wasn’t a full-time salary there. He has a family to feed. He doesn’t like to talk about money, but it has to be talked about. People may not be using new media because they don’t know it’s there. For them to know it’s there, there needs to be money. People need to be told where to go for the content and how to get it. If we want Catholic new media to succeed in the next 5 to 10 years, we need to identify realistic ways of funding this. The Church has been known for centuries as a patron of the arts. Michelangelo was a full-time artist being supported by the Church. Today’s podcasters are artists who should be supported by the Church, not just the institution, but also laypeople. Someone could set up a foundation to support new media. Find a way to support people so they can make it their full-time jobs. When Greg and Jennifer left SQPN to go to the Catholic Channel for their radio show, part of the reason was because of the need for job with benefits. Scot said before he started working in Catholic media at the Archdiocese, he didn’t know much about new media. Greg said he’s been a fan of the Archdiocese’s new media work. Scot said there are people looking to the Archdiocese, but they’re looking for ways to identify funding. Benefactors can come to the Church and say they want to fund new media whether inside the diocese or individually. In he past year, the Church has really started to forcefully embrace new media. In the US, last November, Bishop Ron Herzog gave a compelling address to the US bishops to tell them that this isn’t a fad that should be a normal part of diocesan communications. Greg said he also said that if the Church does not exist online, then in 10 years the Church will not exist for teens today. That should shake us to our core. Scot said many US bishops said it’s very important based on that talk. But it didn’t create a sense of urgency such that it needs to be included in a diocesan budget. Bishops needs to be committed to expanding new media presence, but that takes one or two budget cycles. We need to 3 to 5 years to really measure whether dioceses worked to change things. The more that dioceses try things and lay Catholics live their vocation through new media. Greg said the speakers at the CNMC this weekend will include Sr. Anne Flanagan of the Daughters of St. Paul, known as the “nunblogger”, talking about evangelization online. Also Sean Patrick Lovett, director of the Vatican’s FM radio station. On Friday, there is a separate day of workshops beneficial to people and dioceses that are curious about how to get started in new media. One talk will address whether gadgets and gizmos to help people conduct ministry. But they will address the overall message that technology is great, but more importantly we need to be better catechized and share the Gospel with ever more people and bring them closer to God. A goal will be to create community and opportunity for networking. Greg said so much of new media has been like playing darts with a blindfold on. So much is happening so quickly, but if he has found that if they hadn’t been experimenting with new media services they would have missed it. There will be a next Twitter and a next Facebook and we have to ready to embrace them. For so many years there was one type of Catholic media: constant catechesis. People can turn on EWTN and learn something about their faith. But they discovered in Catholic new media a huge desire for a social component to feel like a companion on a spiritual journey. One of the most frequent things Greg hears is that listening to them is like sitting down and getting to know someone in the next pew. They are laos told it’s edifying to hear someone express both the joys and struggles of living the Catholic faith. People often feel a sense of isolation in trying to live out their faith. Through podcasts and blogs, people now feel that connection. Scot said with the expansion of Catholic new media and Catholic radio, people can now hear the voices of others living their faith. Through blogs and social media, people can read about those struggles. Those struggles aren’t new, but they can feel like they’re the only ones. Interested people can watch many of the events live streaming online at SQPN.com. On Twitter, they will use hashtag #cnmc11. Last year, everyone was using Twitter with the hashtag to send out key passages and bits of information and staying connected even when they weren’t in a particular session. 2nd segment: Scot told Greg he was pleased to see that The Catholiocs Next Door runs 1-4pm Monday-Friday on Sirius XM and doesn’t conflict with The Good Catholic Life. Greg said it’s been a blessing for him and Jennifer to be on Sirius XM over the past three years. It’s been an unexpected benefit is just how much married couples appreciate hearing another married couple. They don’t candy-coat it. Some days on the air, they even have arguments. They’ve even been able share great news with people, including the announcement of their next child last week. But that also allowed them to talk on the air about the real concerns it brings up, like how they best take care of their children and rearrange their lives to accommodate the next one. They are showing how they are treating their marriage as seriously as God wants them to and being a witness to the openness to life. He feels like he’s constantly falling down as a Catholic, but also showing how God lifts him up time and again. Scot said it’s a gift to the Church to be able to be open about their lives. He asked how he makes sure it doesn’t weaken their family by being on the air five times a week. Greg and Jennifer said they were realistic from the beginning about the need to put their families first even as they share so much of their lives and families. There is much that they keep to themselves. They commit to making time just for each other. They place the sacramental life of their family first. They will even “call an audible” and take a day off when they need it. They have a new book coming out in the Spring called “The Catholics Next Door: Adventures in Imperfect Living”. They write about the aspects of their Catholic faith that are the most important things to them, what they have the most interest in. One chapter is on how they came to a deeper understanding of the Eucharist. Another chapter is about TV watching and entertainment and how they find good entertainment. Should be out last week of March or first week of April from Servant Publications. Greg and Jennifer started Rosary Army in 2003. It was the Year of the Rosary declared by Pope John Paul II. He started making all-twine rosaries and giving them away. He’s not exactly a crafty guy and people don’t think of him as a crafter. He found over that year that there were a lot of people affected by the rosary. They started the website RosaryArmy.com to encourage other people to begin making them, creating kits and instructions. They also offered to give away rosaries to anyone who wanted them. People make the rosaries and send them to Greg and Jennifer who send them back out. Greg said from the beginning that they would trust Jesus they would everything they need to have them and for eight years they have. Rosary Army will have big exciting news at the beginning of 2012. It was also the genesis of the Willitses’ first podcast. Scot asked the significance of using twine and not other expensive materials. In 2002, he went to confession and saw the priest holding a single-decade knotted rosary. About two months later, at work, suddenly he remembered the rosary. He found instructions on how to make one and it was very difficult to find them and the materials. The great thing about the knotted rosaries (which have a metal crucifix at the recommendation of Pope John Paul II), is that they’re inexpensive and can be made anymore. It’s also a great evangelistic tool to start a conversation with someone about it. Their motto is Make them, Pray them, Give them away. They estimated a few years ago that Rosary Army has given away several million rosaries. Greg and his mom have a competition. His record is 13 minutes. But he can make one now in about 20-30 minutes. Scot said he has a lot of relatives who love to knit and this could be an activity people like that can do to reintroduce people to the power of prayer. Scot said there’s a new CatholicTV sitcom that the Willitses have created along with CatholicTV called “Mass Confusion.” Greg had the idea for the show last year before the CNMC and he ambushed Fr. Bob Reed at the CNMC with it. They created along with their friends Mac and Katharine Barron who do the Catholic in a Small Town podcast. Fr. Reed loved the idea and so the Willitses and Barrons put together a pilot script. He noted that it goes back to the funding issue. There’s no way to do this series without funding. They filmed it last June in their own home with a crew from CatholicTV. They wanted to make a show for families that wasn’t cheesy, but wasn’t inappropriate. It was shot in a style similar to The Office of Modern Family. It’s like a scripted reality show, but completely fictional. The storyline is that it’s somebody’s birthday, the guys go to the beer store with the babies, and the wives stay home and someone might be pregnant. It premieres on Thanksgiving on CatholicTV at 8pm. Greg estimated it would cost $1 million to do a full season of the show with a full-time cast and crew. If it doesn’t happen, maybe it will motivate someone else to take chances and risks and to have fun. Catholicism is fun. 3rd segment: Now, as we do every week, we look forward to this coming Sunday’s Mass readings to help us prepare to celebrate together. my friend’s song concerning his vineyard. Scot said it’s not the most optimistic Sunday readings. Fr. Mark said it’s an interesting pairing. Clearly Jesus was hearkening back to Isaiah. Scot said the people weren’t producing any fruit and not seeing themselves as stewards of the land, but owners of the land. In a historical perspective, this is Israel in the Old Covenant and the New Covenant in God’s Church. Jesus’ death and resurrection restored our relationship with God. We should reflect on how we are stewards of God’s gifts to us. Few of us work in vineyards, but we all working the vineyard of the Lord with our God-given gifts. Do we look at them as gifts or do we look at everything I am and that I have as something that is mine and because of me? If we act as stewards of all those things, it gets us closer to being the type of person God’s wants us to be. Fr. Mark said there are many levels of audiences being addressed. The first level is the Pharisees and Sadduccees who will have Jesus crucified. Then Matthew is speaking to the early Church community which is dealing with the incorporation of Gentiles into what had previously been a mainly Jewish movement; is the Church for the Jews or the Gentiles or both? There’s a new thing that is neither Jew nor Gentile in Christ. In today’s age, so many people want to kill the voice of Jesus in society and our lives. They want to eliminate this voice is fouling up our plans to live life as we please. We have to keep the voice of JEsus alive by planting seeds of vocations and bear fruit. Scot said we have to consider how our society has embraced or rejected the cornerstone, which is Jesus, and how have we embraced or rejected Jesus? If we’ve rejected our entire lives until, we can make a decision to chart a new path from this day forward, possibly through the graces of the sacrament of confession. We begin a new relationship with Jesus to last a lifetime, in this life and the next. We can think about time as God’s gift to us and spend more of it in his presence all day; our talents and gifts as gifts of God and putting them at the service of others and the Church; and our money and possessions and asking how God wants me to spend my wealth, how he wants us to be generous. The answers can be different at different phases of our lives, but we need to be consider the questions. God always answers that request for direction and discernment. Fr. Mark said we all use our talents and plant the seeds, but the other message is that we will still be rejected y others. Sometimes we’re called to preach or work, but even so we will fall flat on our face or be rejected. God knows that, but still he keeps sending workers. Scot said we’re not the first or the last that it will happen to. Jesus himself was rejected as were 10 of the original 12 apostles. Our job isn’t to measure the results of trying to bring the faith to others. Our job is to try and then try again in faith, believing God wants us to bring the faith to others. Fr. Mark said when he was in seminary, he was sent to visit a patient, who kicked him out and didn’t want to see him, but the guy in the next bed said, hey I’ll see you.